My guess — it’s inviting. Of course, the food is important. Yet ambiance also is a part of the decision. And lighting plays a definite role in ambiance. I’ve designed sports bars, sushi bars and high-end restaurants. All of them use lighting to accentuate the product and the people within the space. With so many different ways to use light, I love to take a fairly mundane space and change it dramatically. Lights set the mood and highlights important things like a painting or an architectural feature. A beautiful fixture becomes a center point. Lighting built into the architecture, does wonders. When I consider how to light a restaurant, the first step is to look at its proportions. I design the spaces first, to get the right ceiling height and distances. You shouldn’t be squeezing into corners to get to your table! Then, my team goes back and figures out how to light the space. Sometimes we want to put an interesting fixture, but that’s secondary. For example, a year and a half ago, when we designed J Peters Grill & Bar, on Lake Wylie near Charlotte NC, LED technology was fairly new, and the owner wasn’t sure what he wanted. So we had a discussion on what would be best for the architecture and the feelings he wanted to evoke. It’s a pretty nice sports bar. Here is what we did: At each table, a pendant light comes down within about 4 ft. of the surface, and then shines directly down on the table. The warm light is reflected and up-lights people’s faces, while casting warm light down on the food. So the food looks better and the person across from you looks their best, too. You don’t want a harsh bright light on a date or really with any dining experience! No thank you, I’d rather not cast shadows on every flaw! 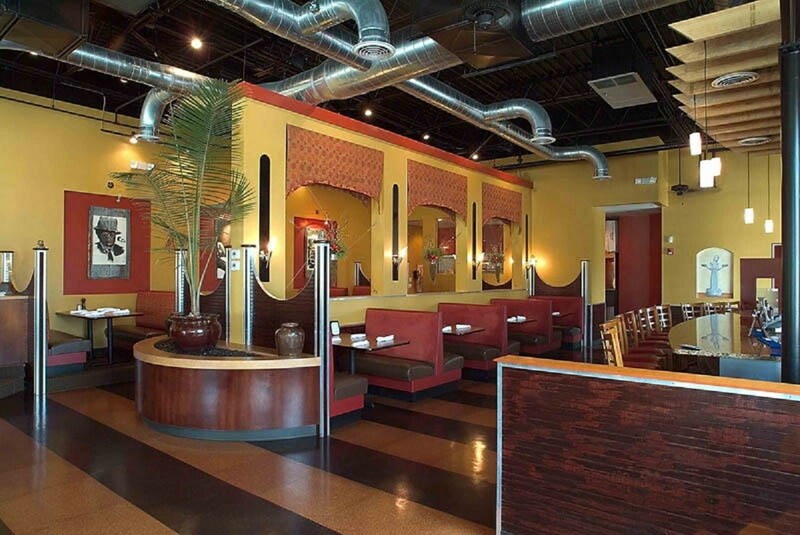 Directional lighting and warm lighting are key pieces for how to light a restaurant.